The brisket taco at Garcia’s Mexican Food. Garcia’s Mexican Food would be easy to miss if it weren’t for the cars parked around the building and up and down the streets in the surrounding neighborhood of Beacon Hill. If you walked by the place when it was closed, you might think it’s a pawnshop because of its melon green walls, and burglar bars that cover the windows and entrance. It’s a different story on the inside. The dining area bustles from open to close. Guests fill every table, and seat at the counter. Through the lunch rush, which starts at 10 a.m., it’s typical for lines to form to the door. Unusual décor hang on the chipped-stucco walls, such as five cockfighting paintings — which co-owner John Garcia, 45, says were gifted to their father in the '80s — and an Elvis Presley clock whose hips shake with every second that passes. 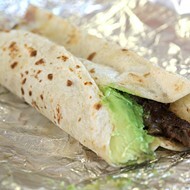 Garcia’s, which opened in 1962 across the street from its current location at 842 Fredericksburg Road, receives the most praise for its brisket taco with guacamole and pico de gallo, according to John. 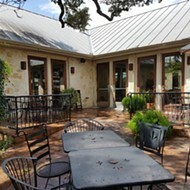 The most recent praise came in December, when Eater.com named Garcia’s one of the best restaurants in America. Handling the sudden rise in business proved difficult at times — as many as 30 to 40 guests would wait outside at a time. The crowd also got younger and more diverse, he said as he pointed out a younger tattooed couple sitting across the 400-square-foot dining area. 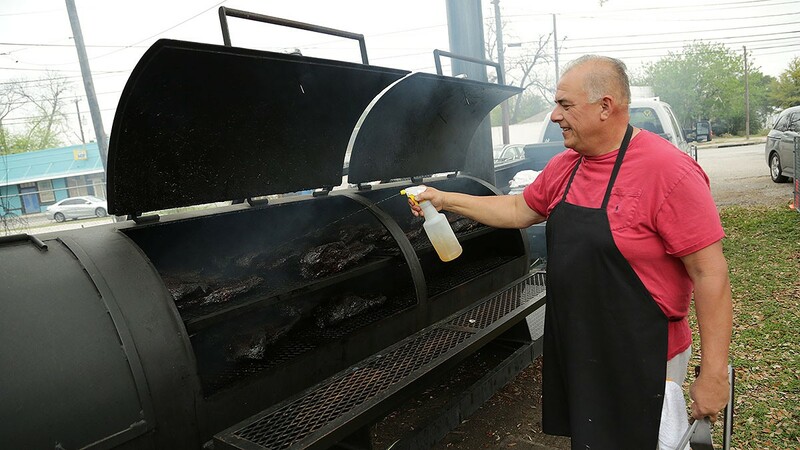 Andrew Garcia, co-owner of Garcia’s Mexican Food, 842 Fredericksburg Road, tends to briskets on the smoker behind the restaurant. 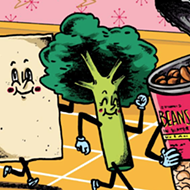 Or, as Andrew Garcia, co-owner and John’s brother, calls them: the foodies. 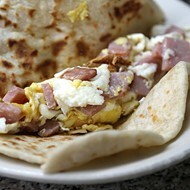 “They say they want an egg taco with a slice of brisket, and they’re changing it all up,” Andrew, 55, said. “I say, ‘OK, I’ve never eaten that.’ They put a slice of brisket with an over-easy egg. They know what they want, so we do it. Although business hasn’t been as hectic since the Eater article was first published, John said that overall it has increased. Since Garcia’s opened, nothing has changed much aside from a recent roof remodeling. The sign, now faded and weathered, has been the same since the 80’s. They use the same cast-iron pots their parents used when they opened the restaurant. The walls are half stucco and half wood paneling; the bathrooms are still located on the outside of the building, which John says must have been common in the '60s. John and Andrew grew up living the restaurant life. 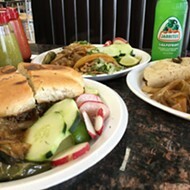 Their father, Julio Garcia, started the business in 1962, along their mother Yolanda, across the street from its current location as a 10-foot-by-10-foot “shack,” as John calls it. It moved to its current location in 1970. “We’ve been working here since we were kids,” John says. When their father retired in 2002 because of health complications, the brothers took over. In addition to the food, John credits his staff with the success of the restaurant. Waitress Juanis Garcia, 32, no relation, has worked at Garcia’s for five years. Celebrities like standup comedian Gabriel “Fluffy” Iglesias and ZZ Top guitarist Billy Gibbons have visited Garcia’s more than once, John said. Country music artists Joe Nichols and Tracy Byrd are also fans of Garcia’s, according to John. 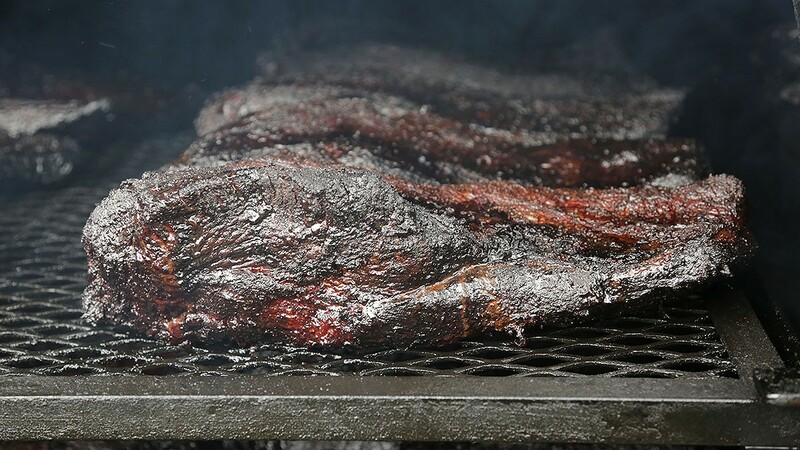 Nichols had brisket delivered to Cowboys Dancehall before a performance there two years ago. John didn’t recognize Byrd at first when he dined at Garcia’s, since he doesn’t follow country music, but was ecstatic once he found out who he was. “We’ve had a lot of publicity in the last three or four years with the Eater.com article and others,” John said. “We’ve been really fortunate.”For the most part the menu has stayed the same over the years. 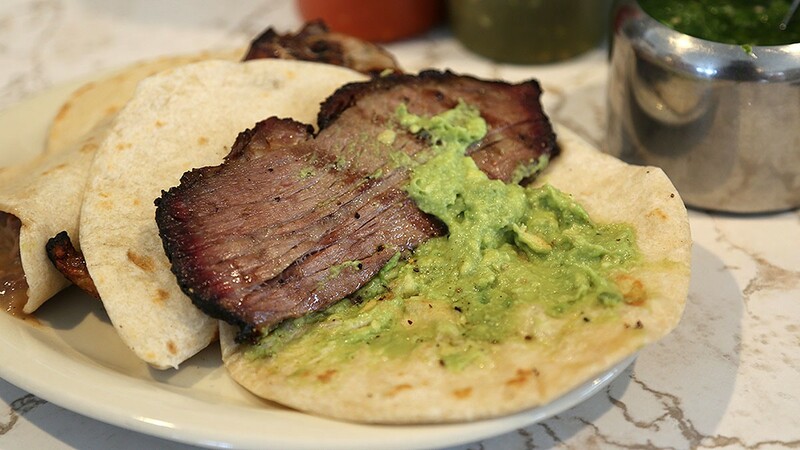 A relative new addition is the brisket taco, which was added more than 10 years ago. Andrew remembers where he got the idea from. Briskets on the smoker outside of Garcia’s Mexican Food. Aside from the brisket, other favorites of customers are the carne guisada, enchiladas and pork chop taco, according to John. “We used to do a bit more barbecue as well, but it got to be too much of a hassle so we narrowed it down to the brisket and pork,” he said. Andrew has slightly altered the recipes since he and his brother took over, but credits his grandparents for setting the cooking standards in the Garcia family. John and Andrew are in the kitchen doing the cooking every day. 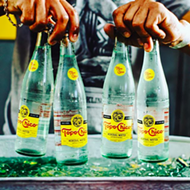 “It’s consistent; we’re always tasting while we cook and we’re here every day,” John said.